« Will Baby Ben Get What he Wants This Holiday Season? That about sums up everything that happened with our Ravens this year, no? After the charmed 2006 (regular) season, in which they won some games they probably shouldn’t have, 2007 proved that, at least in football, the universe does indeed work itself out. We’ll try to rack our brains and painstakingly remember ALL the things that went wrong here…maybe doing it by category will make things easier. Quarterback Steve McNair stumbled out of the gates and never got on track. 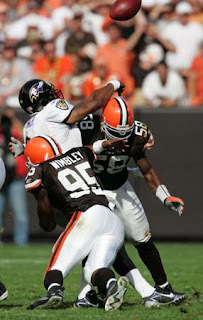 He showed none of the pocket presence or big play making ability of 2006, and his days as a Raven are probably over. He was never healthy, as he injured his groin in week 1, sat out several games with a stiff back, and was ultimately placed on IR with a shoulder injury December 3rd. For the season, McNair turned the ball over 11 times in only 6 starts, while throwing just 2 touchdowns. His replacement, Kyle Boller, showed some promise early on, but in the end just showed that his is nothing more than a capable backup in this league. He threw 9 touchdowns and 10 interceptions in 12 games, and showed that he still has not developed the pocket presence or passing touch needed to be anything better than average. He had perhaps the best game of his career against the New England Patriots, only to revert back to his old erratic self the very next week against Indianapolis. Boller also continued his historically awful play on the road, and his record as a starter outside M&T Bank Stadium is now an abysmal 5-15. He saw his last action in week 15 when he suffered a concussion in Miami. 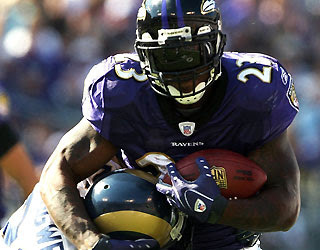 Willis McGahee was the lone bright spot on offense for the 2007 Ravens, running for 1207 yards and 7 touchdowns, and adding 43 receptions for 231 yards and a TD. Often times you’ll hear about a RB buying his offensive lineman expensive dinners or watches after a good season, but the Ravens OL should be the ones giving Willis gifts. He made them look much better than they were playing at times, picking up yards where there were none to be had. McGahee needs to work on his ball security in the offseason, as his 3 lost fumbles were the most of his career. Backup/3rd down back Musa Smith appeared in all 16 games for the first time in his career, and averaged 3.5 ypc. Smith is an unrestricted free agent, and the new head coach will have to decide whether or not to bring him back. We say “Yay.” Smith is a quality guy, and showed great work ethic and commitment in coming back from his grotesque broken leg suffered in 2004 thanks to Roy “What do you mean I can’t tackle like that?” Williams. This group regressed from 2006, thanks to both injuries and poor quarterback play. Mark Clayton was slowed by injury early and saw his numbers dip significantly compared to last year, with 20 fewer receptions, 400 fewer yards, and no touchdowns. He is still the Ravens best YAC player, and the new offensive system needs to get him involved much more. 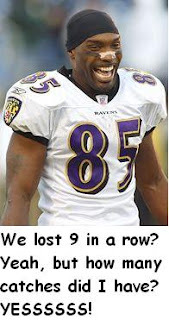 After complaining about being left out of the offense last year, Derrick Mason, set a personal and Ravens record receptions total with 103, while breaking 1000 yards for the 2nd time in B-More. Mason showed he can still find open space, especially on 3rd down, as he led the NFL in 3rd down receptions. At times it seemed like Kyle Boller must have had Mason on his fantasy team, as he wouldn’t even look at the other receivers. Mason had plenty of complaints about a 13-3 team that relied on him only marginally, but very few of a 5-11 team that featured him heavily. One can’t help but question his priorities. Other wideouts Demetrius Williams and Devard Darling had polar opposite seasons. Williams, who established himself as a deep threat in 2006, suffered from the poor play of the offense, which either had a quarterback to weak to throw the deep ball, or an offensive line unable to protect long enough for deep routes to develop (or both! ), and saw his last action in week 10 due to an ankle injury. Darling, relegated to special teams for most of his tenure in B-More, emerged in place of Williams, averaging 18 yards per catch and hauling in 3 touchdowns. Perhaps he will finally start to live up to his 3rd round draft pick, should the Ravens choose to resign him (unrestricted free agent). The injury bug decimated this group as well. Todd Heap played in only 6 games, the last in week 10, due to a hamstring injury. Prior to this season, he had played in all 16 games in 2 straight seasons, and 4 of the previous 5, so don’t be so quick to label him “soft,” as many in town have taken to lately. He will only be 28 at the start of the 2008 season, and we fully expect the “Stormin’ Mormon” to regain his status as one of the league’s elite tight ends. Daniel Wilcox had a laundry list of injuries, and only played in 5 games, after playing in 16, 13, and 14 the past 3 seasons. These injuries forced 2nd year man Quinn Sypniewski into extended duty, and he played reasonably well. His hands and blocking improved throughout the course of the year, and the experience he gained makes this one of the strongest positions for the Ravens going into 2008. Pains of two types here: physical and “growing.” Jonathan Ogden missed weeks 2-6 with his sprained big toe, then took a few more games to round into “game shape,” before finishing up the season as his old, reliable, immovable, bulldozing self. He certainly has a few more NFL games in his tank, if he so chooses. Third year man Adam Terry also missed 4 games, and was only marginally effective when he did play. Word on the street is that he lacks the “mean streak” necessary to be an effective NFL tackle, and rookie Marshal Yanda supplanted him at times. Yanda showed some good things, but seemed to hit the rookie wall towards the end of the season, as did Ben Grubbs, who had a solid debut year. 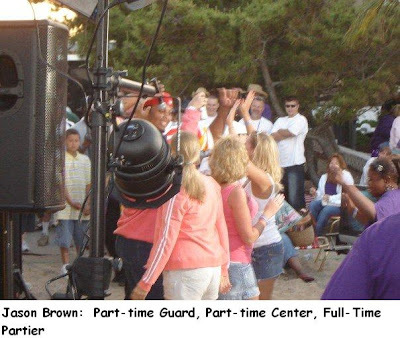 Jason Brown had a good year at guard, and may move to center next season, as Chris Chester had a disappointing 2007 campaign, and Mike Flynn looks set for retirement. This entry was posted on March 14, 2008 at 12:59 pm and is filed under Ravens Season Review. You can follow any responses to this entry through the RSS 2.0 feed. You can leave a response, or trackback from your own site.